Cut plastic, fabric, and paper with the pointed tip 10546 Ceramic Scissors from Slice. The zirconium oxide ceramic blades have Finger-Friendly safety edges that are sharp for materials, but resist cutting skin, and the glass-filled nylon handles have soft comfortable finger grips that can be used by anyone, which is right- or left-handed. 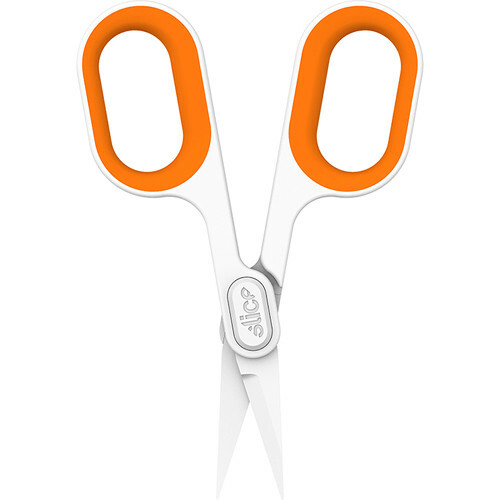 The longer-lasting scissors are BPA-, phthalate-, and lead-free. Also, the blades are non-conductive, non-magnetic, non-sparking, and chemically inert, so the scissors will never rust. Box Dimensions (LxWxH) 5.9 x 3.2 x 0.9"